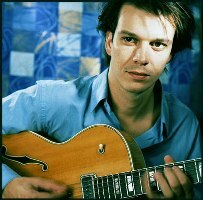 Dutch guitarist Jesse van Ruller was the first European musician to win the prestigious Thelonious Monk Competition in Washington in 1995. The jury, consisting of Pat Metheny, John Scofield, Jim Hall, Pat Martino and Mark Whitfield, was of the opinion that van Ruller is one of the most promising talents of his time. With astonishing technique, clear and warm tone, and fresh musical ideas, van Ruller is one of the most exciting straight-ahead jazz guitarists to watch today. He has performed and recorded with a wide array of renowned musicians and ensembles amongst which are Seamus Blake, Philip Catherine, Toots Thielemans, John Patitutcci, Bill Stewart, Peter Erskine, Joe Lovano, Elvin Jones, Christian McBride, the Metropole Orchestra, the Asko Ensemble and the Birmingham Symphony Orchestra, the Berliner Symphoniker under Simon Rattle and many more.